Shifting emotions are filtered through autumnal sunlight in the Lyceum’s Twelfth Night, with as much defiant sadness on view as happy resolution. 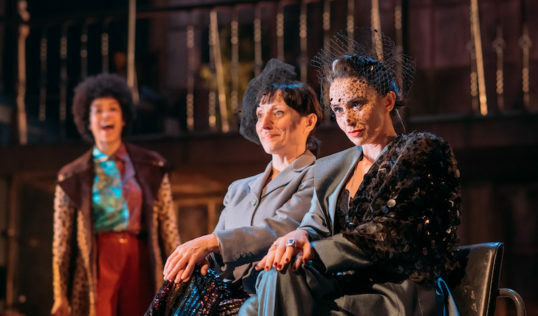 Shakespeare’s comedy of cross-dressing, confusion and misplaced love lends itself easily to contemporary questions of gender identity, and these are certainly explored in this co-production with the Bristol Old Vic. Director Wils Wilson, however, is not necessarily going to address such concerns in the way you might expect, and the audience are certainly wrong-footed at the start. The opening scene – featuring a gaggle of bohemian flower children deciding to perform the play in a dilapidated country house at the close of a period of riotous celebration – strikes an odd note and does not seem necessary. The programme for the play suggests a 60s psychedelic theme, but many of the costumes, notably the platform soles and Elton John specs, seem rather to evoke the 70s glam-rock era. 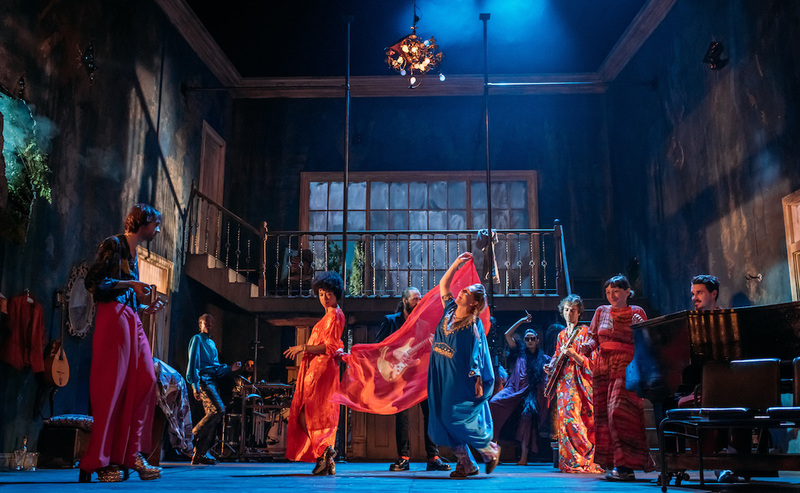 Either way, it promises a primary-coloured riot of brashness, which is certainly true of Ana Ines Jabares-Pita’s striking set and costumes. 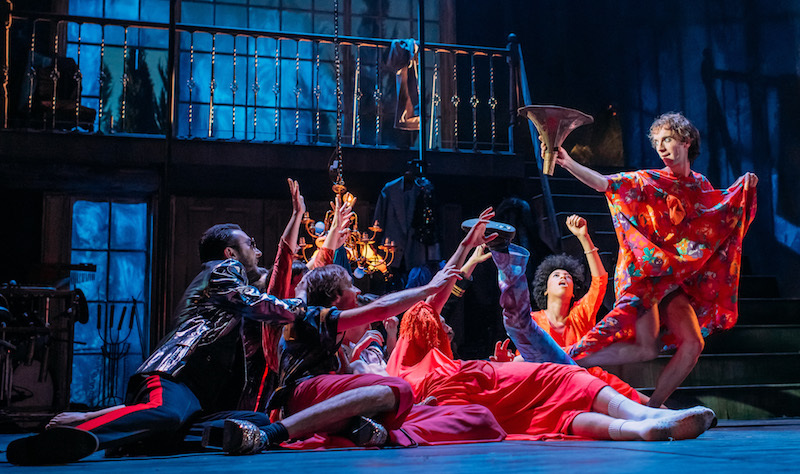 Strange to report then, that there is a woozy melancholy at this production’s heart, echoing that idea of being at a party that has gone on far too long. Meilyr Jones’s haunting music – more reminiscent of earnest 70s singer-songwriters than glittery stompers – only adds to the underlying sorrow. There is always a bittersweet tinge to Twelfth Night, but it is predominant here. Death, cruelty and rejection are always just around the corner. Malvolio’s treatment is often shown to be an exaggerated response to his pomposity, but it is made abundantly clear here that other characters more deserving of happy endings – such as Brian James O’Sullivan’s loyal and thoroughly decent Antonio – do not get them. There is also a deep sadness behind the comedy of Guy Hughes’s Andrew Aguecheek. More a put-upon nice-but-dim toff than the usual self-deluding fop, his treatment as nothing more than a plaything by Dawn Sievewright’s brutally comic Lady Tobi verges on the criminal. Sievewright’s excellent performance is one of many outwardly surprising castings in an intriguingly gender-fluid production. The possibilities for confusion in the original are exploited throughout. Some characters have definitively swapped gender, others are played across gender with no excuse necessary, and some are tantalisingly in between. This gives much of what takes place a strangely unfinished feel, and the pairing off at the end becomes less definitive. The suggestion is that acceptance of difference remains more of a process than a finished item, and there are still going to be those who are left out. One of those left behind is undoubtedly Christopher Green’s Malvolio. The creator of Ida Barr and Tina C can always be relied upon for an unusual characterisation, and his ‘cross-gartered’ incarnation – a bizarre lovechild of Tim Minchin and Basil Fawlty – has to be seen to be believed. 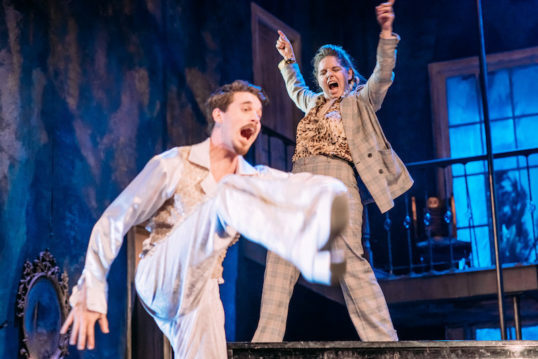 Equally impressive is Dylan Jones’s Feste, a perfect blend of physical and verbal clowning, mixing wistful, hopeful, cynical and mercenary in equal parts. There is also plenty of humanity in Jade Ogugua’s Viola, with her combination of wisdom and naivete lending the more poetic lines an effective lustre. Lisa Dwyer Hogg’s Olivia is very much passion’s slave, giving her exchanges with Viola a raw power. 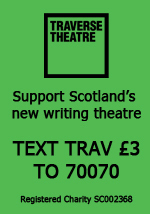 Colette Dalal Tchantcho gives Orsino’s jealousy and anger an unusual force, while Joanne Thomson’s bewildered Sebastian adds to the Sunday-morning-coming-down feel of the finale. This is reinforced by the lack of resemblance between Thomson and Ogugua, which is partly played for laughs but only adds to the dislocation. There is a real comic spark to Joanna Holden’s Maria, while Aly Macrae seems in danger of bringing the house down doing very little. That this comes in a 60s spin on the role of the Priest shows that whole chunks habitually cut out are left intact here. This undoubtedly makes for a very long production. And that is without considering the added songs. These are, admittedly, wonderfully discharged by a musically versatile cast. A little judicious trimming might have made for a tighter ship – many of the serious scenes are in danger of outstaying their welcome, while not all of the comedy hits the mark – yet in one sense it is this production’s slightly baggy feel that is one of its attractions. The casting and staging choices make for an open-ended, questioning evening. It is far from the mind-expanding clarion call it might appear. Instead it is an endearing portrait of a world that is decidedly imperfect, with a collection of battered individuals who may make fools of themselves, but are willing to find out who they want to be. 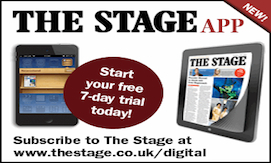 Evenings Tues – Sat at 7.30 pm. Matinees Wed and Sat at 2.00 pm. Wednesday 17 October – Saturday 17 November 2018. Evenings Mon – Sat (not Oct 12): 7.30pm; Matinees Thurs, Sat & Tue 13: 2.30pm. Although there is a lot to like about this production – the music, individual performances and clever staging, I also found a lot of it quite irritating. 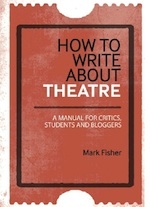 I agree the beginning isn’t needed and it irritated me before we’d even got to the Shakespeare! It seemed to say “let’s do something really different”, but there has to be a logical rationale for it and I didn’t think it was justified. I also found Tobi Belch irritating – I really don’t like characterisation which tries to get laughs by putting on silly voices. Shakespeare’s text should be enough. I did like a lot of the performances – Viola’s in particular. Malvolio seemed as if he’d been studying Michael Crawford’s portrayal of Frank Spencer, especially in the first letter scene where is tricked. I enjoyed the second half a lot better – I loved the opening song and the scene where Malvolio appears, cross-gartered and yellow-stockinged was very funny, in a Rocky Horror sort of way! I do agree that some of the humour just misfired, as they were trying too hard, especially the scenes with Tobi, Maria and Andrew. The cast also delivered the Shakespearean text very well and the key scenes when there were two characters were good. Sherlock Holmes The Sign Of Four: Fri. This is Us: Thurs – Sat. An Evening of Eric and Ern: Wed. In the Night Garden: Fri – Sun. Local Hero: Tue – Sat. 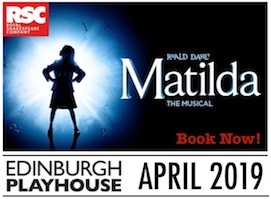 Matilda The Musical: Tue – Sat. PPP: The Mack: Tue – Sat. 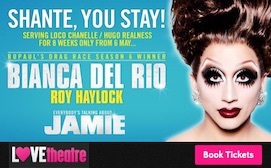 © 2019 All Edinburgh Theatre.com. All rights reserved. Design by Stuff and Content. Æ uses our own and third party cookies. If you continue browsing we consider you accept the use of these cookies.